Martha Berry thanks a Mr. S. Guthman for his promised contribution of $20.00 to the silver anniversary fund and hints that he should send this money now, but that anytime would be all right. 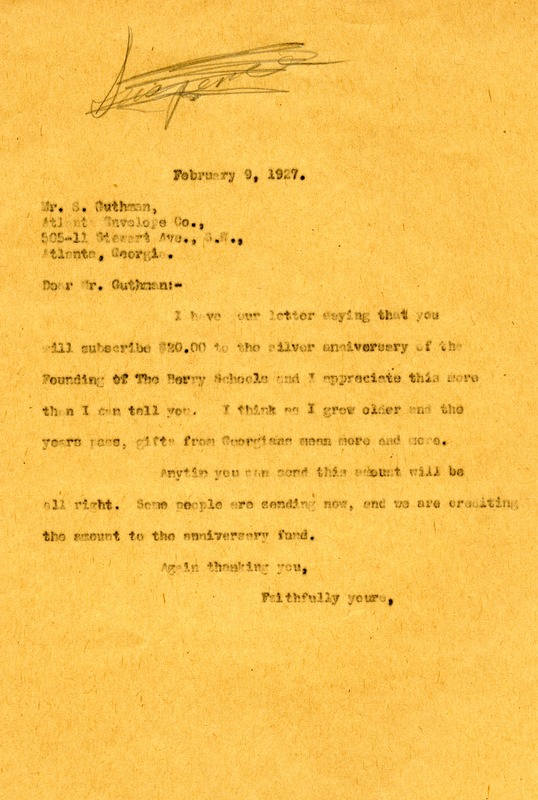 Miss Martha Berry, “Letter to Mr. S. Guthman from Martha Berry.” Martha Berry Digital Archive. Eds. Schlitz, Stephanie A., et al. Mount Berry: Berry College, 2012. accessed April 24, 2019, https://mbda.berry.edu/items/show/6353.